It’s biblical in name and spirit. It is welcoming, a unique blend of a bistro, a bar and a lounge offering much more than what’s on the menu and its 290 different wines. It is Farragut’s Water into Wine Bistro and Lounge. Its vision and spirit emanate from its owner, Candace Viox, and from her late mother. “This is one way-cool place. I’ve never been in a place quite like it – anywhere.” That’s what one customer told me as I walked away from a recent visit with Candace. After spending two hours with her and hearing her story it’s no wonder that, 15 months after opening, she’s going strong and ready to add off-site catering to her offerings. This is no ordinary bistro and lounge. Candace describes it as a “classy relational bar.” Her customer base is 85 percent female with women from 21 to 70-plus. “But we have guys who come in here as well, but not many,” she says. W2W carries the personality of its owner. Getting it open and finding success is wrapped up in that personality – a combination of fun, high energy, being feisty, tough and passionate. She’s got smiling and hugging down pat. She stays as busy at home as she does at work with a 22-year-old daughter at the University of Tennessee and three adopted children and two foster children living with her. In fact, though closed on Mondays, she does open the doors for a 2 p.m. weekly Bible study – that she leads. W2W is open five days a week, Tuesday through Saturday – 11 a.m. to 11 p.m. Tuesday, Wednesday and Thursday and 11 a.m. to midnight on Fridays and Saturdays. Fresh flowers daily are on the tables. There are two small semi-private lounge areas available for reservations for small groups of five or six people. Wednesdays are special as well. 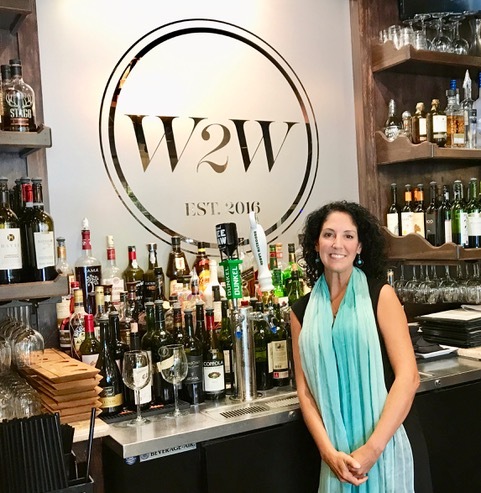 “Working Women Wednesdays” is a weekly special event for networking from 6:30 to 8:30 p.m. “They talk business and they talk life,” Candace says.